Franny’s supposed to be working this summer, not flirting. But you can’t blame her when guys like Alex and Harry are around. . . . Franny Pearson never dreamed she’d be attending the prestigious Mansfield Summer Theater Program. And she’s not, exactly. She’s working for her aunt, the resident costume designer. But sewing her fingers to the bone does give her an opportunity to spend time with her crush, Alex Braverman. If only he were as taken with the girl hemming his trousers as he is with his new leading lady. When Harry Cartwright, a notorious flirt, shows more than a friendly interest in Franny, she figures it can’t hurt to have a little fun. But as their breezy romance grows more complicated, can Franny keep pretending that Harry is just a carefree fling? And why is Alex suddenly giving her those deep, meaningful looks? In this charming tale of mixed messages and romantic near-misses, one thing is clear: Flirting might be more trouble than Franny ever expected. The Trouble with Flirting is a lose retelling of Mansfield Park by Jane Austen. The main character Franny can’t believe she’s actually attending the prestige Mansfield Summer Theater Program. Sure, she’s not actually participating, she’s working for her aunt, sewing the costumes for all the productions. She prepared herself for a summer in the sweat shop, what she didn’t prepare herself for were Alex and Harry. As the two boys take residence in Franny’s life, the real fun begins. I really enjoyed The Trouble with Flirting. I loved Franny as a character. She was cynical and sarcastic and sounded just like your typical teenager. I love books where the main character is someone you can totally relate to, someone you can see yourself being on a regular basis. Sometimes characters have a tendency to kill a good story just by the fact that they annoy me to no end, but this book wasn’t like that. Now, Alex and Harry. Two guys who are completely different, but oh so swoon worthy. Alex is your boy next door sweet while Harry is your confident center of attention character. I enjoyed Franny’s dynamic with both of the boys, but I have to admit, I had my favorite from the beginning. I won’t be telling you who it is because for once the main character picked the same guy I did! Seriously, that hardly happens. Overall, the story was well written and fun. The characters were believable and relatable, and I laughed more than once at certain people’s antics. This was my first book by Claire but I’m thinking I really need to read Epic Fail that’s on my shelf. I’m a huge fan of Jane Austen and I felt like Claire did a great job taking the story and making it her own. 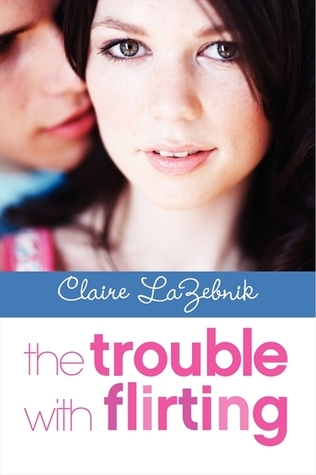 The Trouble with Flirting comes out February 26th, 2013. Let me know what you think!